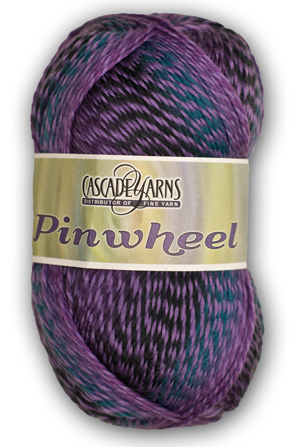 Pinwheel is a 100% acrylic, easy-care yarn in a worsted weight. Pinwheel is made with two contrasting-color strands, wrapped around each other for the ultra, candy-cane effect that resembles a delightful visual texture of fun. It's also self-striping, with long color changes. This machine washable yarn is fantastic for baby projects, but also comes in colors that are great for adults, too.